Specifications Print specifications Article Nr. 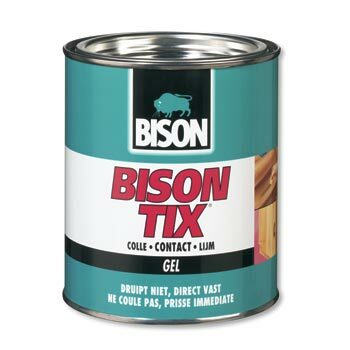 1305375 Description Bison Tix® Tin 750 ml NL/FR Model BS-48 Brand Bison Product description Catalogue Super-strong, gelified, universal contact adhesive: easy to spread, does not drip and forms no strings. Description - Sales sheet Bison Bison Tix® Tin 750 ml Field of Application - Sales sheet Bonds plastic panel boards (such as Formica®), veneer, hardboard, plastic edges, rubber, leather, linoleum, cork, textiles and polyether foam to themselves as well as to wood, chipboard, concrete and metal. This adhesive does not drip and is therefore very suitable for vertical bonding. Excellent for bonding stair edgings, floor coverings and stair carpets, furniture tips and felts, among other things. Also for repairing shoes, bags, toys and carpets, or for doing (hobby) handicraft work. Product description - Adhesive computer Super-strong, gelified, universal contact adhesive: easy to spread, does not drip and forms no strings.